A Mitsubishi G4M1; notice the non-standard roundel, which has a white square instead of the white circle surrounding the hinomaru. The Mitsubishi G4M (long designation: Mitsubishi Navy Type 1 attack bomber: 一式陸上攻撃機, 一式陸攻 Ichishiki rikujō kōgeki ki, Ichishikirikkō) was the main twin-engine, land-based bomber used by the Imperial Japanese Navy Air Service in World War II. The Allies gave the G4M the reporting name Betty. Japanese Navy pilots called it Hamaki (葉巻, "cigar", lit. "leaf roll") due to its cylindrical shape. The G4M had very good performance, especially in operational range; this was achieved by its structural lightness and an almost total lack of protection for the crew, with no armor plating or self-sealing fuel tanks. These omissions proved to be the aircraft's weakness when confronted with American fighter aircraft during the Pacific War. 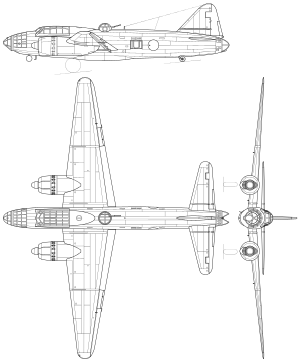 The G4M was designed for a long range and high speed at the time of its introduction. Consequently, several weight-saving measures were incorporated into the design, such as dispensing with self-sealing fuel tanks and armor, which caused Allied fighter pilots to give it derisive nicknames such as "the one-shot lighter", "the flying Zippo" and "the flying cigar" because of their tendency to explode or catch on fire from any slight damage to the wing fuel tanks after being hit by aerial machine gun fire or ground-based anti-aircraft fire. Similarly, pilots of the Imperial Japanese Navy despairingly called the G4M the "type one lighter", the "flying lighter" and the "hamaki" ("cigar"). This was partially due to the fact that on many occasions, the G4M was used for low-altitude torpedo attacks on ships during which their performance advantages were negated. The G4M was frequently shot down by anti-aircraft artillery fire, and even by small arms. The G4M's relatively large size made it an easy gunnery target, and the predictable approach path required for a torpedo run made for a generally easy interception by Allied fighter aircraft. A Mitsubishi G4M2 on the ground. When used for medium- to high-altitude bombing against stationary land targets like supply depots, seaports or airfields, it was much harder to intercept. Using its long range and high speed, the G4M could appear from any direction, and then it could be gone before any fighters intercepted them. The 20 mm cannon in its tail turret was much heavier armament than was commonly carried by bombers of either side, making aerial attacks from the rear quite dangerous for the Allied fighter aircraft. Sometimes, assuming they did not catch fire after being hit in the wings by flak from the ground or by machine gun bullets from enemy fighters, G4Ms also proved to be able to remain airborne despite being badly damaged. For example, after the attack of the 751 Kōkūtai (air group) on the USS Chicago during the Battle of Rennell Island, three out of four surviving aircraft (of the original eleven) returned despite flying with only one engine. The G4M was similar in performance and missions to other contemporary twin-engine bombers such as the German Heinkel He 111 and the American North American B-25 Mitchell. These were all commonly used in anti-ship roles. The G4M Model 11 was prominent in attacks on Allied shipping from 1941 to early 1944, but after that it became increasingly easy prey for Allied fighters. The G4M was first used in combat on 13 September 1940 in Mainland China, when 27 "Bettys" and Mitsubishi C5Ms of 1st Rengo Kōkūtai (a mixed force including elements of the Kanoya and Kizarazu Kōkūtai) departed from Taipei, Omura, and Jeju City to attack Hankow. The bombers and the reconnaissance aircraft were escorted by 13 A6M Zeros of 12th[clarification needed] Kōkūtai led by the IJN lieutenant, Saburo Shindo. A similar operation occurred in May 1941. In December 1941, 107 G4Ms based on Formosa of 1st Kōkūtai and Kanoya Kōkūtai belonging to the 21st Koku Sentai (air flotilla) crossed the Luzon Strait en route to bombing the Philippines; this was the beginning of Japanese invasions in the Southwest Pacific Theater. IJN aviators pressed home a torpedo attack against American ships off Guadalcanal on 8 August 1942, suffering heavy losses. The plane on the left and at extreme low-level (approximately five meters) was flown by Jun Takahashi, who was still alive in 2016. The G4M's most notable use as a torpedo bomber was in the sinking of Prince of Wales and Repulse off the eastern coast of Malaya on 10 December 1941. 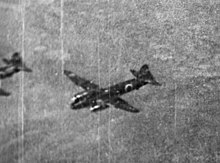 The G4Ms attacked along with older Mitsubishi G3M "Nell" bombers, which made high-level bombing runs. Prince of Wales and Repulse were the first two capital ships to be sunk exclusively by air attacks during a war, while in open waters. The bomber crews were from the Kanoya Air Group of Kanoya Kōkūtai (751 Ku), Genzan Air Group of Genzan Kōkūtai (753 Ku), and the Mihoro Air Group of Mihoro Kōkūtai (701 Ku), trained in torpedo attacks at an altitude of less than 10 metres (30 ft), and in long-range over-ocean navigation, so they could attack naval targets moving quickly at sea. Nine G4Ms participated in the long range bombing raid of Katherine, Northern Territory, on 22 March 1942 (the deepest inland attack on Australian territory during the war at over 200 miles from the coast). G4Ms later made many attacks against Allied ships and also land targets during the six-month-long Guadalcanal Campaign (in the Solomon Islands) in late 1942. On 8 August 1942, during the second day of the U.S. Marine landings on Guadalcanal, 23 IJNAF torpedo-carrying G4M1s attacked American ships at Lunga Point. 18 of the G4M1s were shot down, by very heavy anti-aircraft fire and carrier-based F4F fighters. In all 18 Japanese crews – approximately 120 aviators – were lost at the beginning of August 1942. More than 100 G4M1s and their pilots and crews were lost (with no replacements or substitutes available) during the many battles over and near Guadalcanal (August to October 1942). In the two days of the Battle of Rennell Island, 29 and 30 January 1943, 10 out of 43 G4M1s were shot down during night torpedo attacks, all by U.S. Navy anti-aircraft fire. About 70 Japanese aviators, including Lieutenant Commander Higai, were killed during that battle. Probably the best-known incident involving a G4M during the war was the attack resulting in the death of Admiral Yamamoto. On 18 April 1943, sixteen P-38 Lightnings of the 339th Fighter Squadron of the 347th Fighter Group, Thirteenth Air Force, shot down a G4M1 of the 705th Kokutai with the tailcode "T1-323", carrying Admiral Yamamoto. Yamamoto's G4M1 in the aftermath of the attack. The G4M Model 11 was replaced by the Models 22, 22a/b, 24a/b, 25, 26, and 27 from June 1943 onward, giving service in New Guinea, the Solomons, and the South Pacific area, in defense of the Marianas and finally in Okinawa. Other G4Ms received field modifications, resulting in the Model 24j. This model carried the Yokosuka MXY7 Ohka Model 11 suicide flying bomb, beginning on 21 March 1945, with disastrous results due to heavy Allied fighter opposition. After the loss of Okinawa, G4Ms constituted the main weapon of the land-based Japanese naval bomber force. It consisted of 20 Kōkūtai at the end of the war. This included the testing air group, which was equipped in 1944–45 with the latest version G4M3 Models 34 and 36, though these arrived too late to affect the course of the war. From November 1944 to January 1945, G4Ms were one of the main types of aircraft used in the Japanese air attacks on the Mariana Islands, and plans to use converted G4Ms to land commandos on the islands were developed in mid-1945 and cancelled only at the end of the war. As part of the negotiations for the surrender of Japan, two demilitarized G4Ms, given the call-signs Bataan 1 and Bataan 2, flew to Ie Shima, carrying the first surrender delegations on the first leg of their flight to Manila. The G4Ms were painted white with green crosses, and were escorted by American P-38 fighters. The G4M's intended successor was the Yokosuka P1Y Ginga, although because of production problems, the changeover was only begun by the time the war ended. (Mitsubishi Navy Type 1 attack bomber) / (Mitsubishi Navy Experimental 12-Shi land attacker). Two prototypes built. March 1942: the first aircraft (241st production example) fitted with Mitsubishi MK4E "Kasei" Model 15 engines with larger superchargers for better high altitude performance, became standard in August 1942 from 406th aircraft onwards. These MK4E-engined aircraft have often (erroneously) been referred as the "G4M1 Model 12". March 1943: from 663rd machine onwards, 30 mm (1.181 in) rubber ply sheets installed beneath the wing outer surfaces to protect the underside of the fuel tanks (speed reduced by 9 km/h (4.9 kn; 5.6 mph) and range by 315 km (170 nmi; 196 mi), 5 mm (0.197 in) armour plates added into tail gunner's compartment. Spring 1943: outer half of the tail cone cut away in order to improve tail gunner's field of fire. August 1943: a completely redesigned tail cone, with reduced framing and wide V-shaped cut out; this form of tail cone was also used in all G4M2 models. Production of the G4M1 ended in January 1944. The first of the four G4M2 prototypes flew in December 1942 (Mitsubishi Navy Type 1 Attack Bomber Model 22). It differed from the preceding model in having Mitsubishi MK4P "Kasei" Model 21 engines with VDM electric four-blade propellers capable of full feathering function, redesigned main wings with LB type laminar flow airfoil. [N 1] and widened tail horizontal stabilizer wing area, which improved service ceiling to 8,950 m (29,360 ft) and maximum speed to 437 km/h (236 kn; 272 mph). Main wing fuel tanks were enlarged to 6,490 l (1,710 US gal; 1,430 imp gal) which increased the range to 6,000 km (3,200 nmi; 3,700 mi) (overloaded, one way). An electrically powered dorsal turret featuring a 20 mm (0.787 in) Type 99 cannon was introduced in place of G4M1's dorsal position with a 7.7 mm (0.303 in) Type 92 machine gun, total guns armed were two 20 mm (0.787 in) Type 99 cannons (one tail turret, one top turret), and four 7.7 mm (0.303 in) Type 92 machine guns (one nose, two waist, and one cockpit side). External differences also included increased nose glazing, flush side gun positions instead of blisters, and rounded tips of wings and tail surfaces. These major improvements also made it possible for the G4M2 to carry more powerful bombs; one 1,055 kg (2,326 lb) Navy Type 91 Kai-7 aerial torpedo or one 800 kg (1,800 lb) bomb or two 500 kg (1,100 lb) bombs or one 800 kg (1,800 lb) Type 3 No. 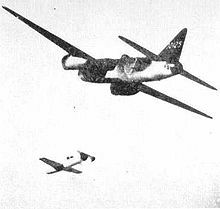 31 bomb (ray-detective type bomb) and twelve 60 kg (130 lb) bombs. The G4M2 entered service in mid-1943. Betty bombers during an air raid over Darwin, Australia. (Mitsubishi Navy Type 1 Attack Bomber Model 22) the base model, the first production example completed in July 1943. Introduced bulged bomb bay doors from 65th aircraft onwards, and an optically flat panel in the nose cone from the 105th aircraft onwards. (Mitsubishi Navy Type 1 Attack Bomber Model 22 Ko) very similar to previous model. Carried Type 3 Ku Mark 6 search radar and was armed with 20 mm (0.787 in) Type 99 Model 1 cannon s replacing the 7.7 mm (0.303 in) Type 92 machine guns in the lateral positions. (Mitsubishi Navy Type 1 Attack Bomber Model 22 Otsu) dorsal turret cannon changed to longer-barreled 20 mm (0.787 in) Type 99 Model 2 cannon. (Mitsubishi Navy Type 1 Attack Bomber Model 24) modified Model 22, Mitsubishi MK4T Kasei 25 1,340 kW (1,800 hp) engines, with bulged bomb bay doors as standard for larger bomb capacity. Externally distinguishable from the Model 22 by a carburetor air intake on the top of the engine cowling. (Mitsubishi Navy Type 1 Attack Bomber Model 24 Ko) armament similar to Model 22 Ko. (Mitsubishi Navy Type 1 Attack Bomber Model 24 Otsu) armament similar to Model 22 Otsu. (Mitsubishi Navy Type 1 Attack Bomber Model 24 Hei) modified 24 Otsu, with one 13.2 mm (0.520 in) Type 2 machine gun mounted in tip of the nose cone, radar antenna relocated from that position to above the nose cone. (Mitsubishi Navy Type 1 Attack Bomber Model 25) one G4M2a modified to Mitsubishi MK4T-B Kasei 25 Otsu 1,360 kW (1,820 hp) engines. Only experimental. (Mitsubishi Navy Type 1 Attack Bomber Model 26) two G4M2as modified to Mitsubishi MK4T-B Ru Kasei 25b 1,360 kW (1,820 hp) engines with turbochargers. (Mitsubishi Navy Type 1 Attack Bomber Model 27) one G4M2 modified to Mitsubishi MK4V Kasei 27 1,340 kW (1,800 hp) engines. Mid- or late-production G4M1 Model 11s with the propeller spinners and rubber ply beneath the wing fuel tanks. Early production G4M1s of Kanoya Kōkūtai with the original shape tail cones. (Mitsubishi Navy Type 1 Attack Bomber Model 34 Tei) redesigned G4M2 with added self-sealing fuel tanks, improved armor protection and an entirely new tail gunner's compartment similar to that of late model B-26 Marauders. Wings were also redesigned and the horizontal tailplane was given dihedral. Armed with two 7.7 mm (0.303 in) Type 92 machine guns in nose cabin and in both side positions, and one 20 mm (0.787 in) Type 99 Model 1 cannon in dorsal turret and tail. Entered production in October 1944 in G4M3a Model 34 Ko form with 20 mm (0.787 in) Type 99 cannon in side positions instead of machine guns. (Mitsubishi Navy Type 1 Attack Bomber Model 34 Hei) similar modifications as in corresponding Model 24 variants. (Mitsubishi Navy Type 1 Attack Bomber Model 34 Otsu) similar modifications as in corresponding Model 24 variants. (Mitsubishi Navy Type 1 Attack Bomber Model 36) prototype. Two G4M2 Model 34 modified to Mitsubishi MK4-T Kasei 25b Ru 1,360 kW (1,820 hp) engines. (Mitsubishi Navy Type 1 wingtip convoy fighter) initial model of the series, armed with three 20 mm (0.787 in) Type 99 cannon (two in a belly blister, one in the tail) and one 7.7 mm (0.303 in) Type 92 machine gun in the nose; 30 built. (Mitsubishi Navy Type 1 large land trainer) trainers converted from G6M1s. (Mitsubishi Navy Type 1 transport) G6M1s modified as transports. Imperial Japanese Navy Air Service operated the type during 1941–45 in a total of 37 Kōkūtai (air groups). Royal Air Force operated at least one captured aircraft for evaluation purposes. United States Air Force, like the RAF, operated captured aircraft for evaluation. No flyable Mitsubishi G4Ms are left although several wrecks remain scattered in southeast Asia and on Pacific islands. G4M1 Model 11 (Serial #1280): On display in a diorama at the Planes of Fame Air Museum in Chino, California in a unrestored condition. The only complete G4M Betty bomber. Built in Nagoya Works No. 3 on 16 April 1942, tail number 370, which had probably crash landed before mid-1944, and was recovered from Babo Airfield, Indonesia, in 1991. G4M1 Betty Model 11 (Serial #1800): Assigned to the 701st Naval Air Group. Abandoned on Ballale Airfield. During August 2018, it was recovered from Ballale Island in the Solomon Islands, along with another G4M1 (Serial #2806) and the fuselage of an early model G4M1 by a "foreign salvager." G4M1 Betty Model 11 (Serial #2806): Tail code U-321, was assigned to the Misawa Naval Air Group in the Solomon Islands from Ballale Airfield. Was abandoned on a revetment, next to a bomb crater, both engines missing. During August 2018 it was recovered by a "foreign salvager" along with another G4M1 Betty Model 11 (Serial #1800) and a fuselage of an early model G4M1. Several other locations display pieces of G4Ms including the restored fuselage of a G4M2 is on display at the Kawaguchiko Motor Museum in Yamanashi Prefecture, Japan. ^ LB type laminar airfoil was designed by Professor Tani of Tokyo University in 1937. ^ Serial no. 603 and later had 30 mm (1.2 in) thick natural rubber plates covering the outside bottoms of the wing fuel tanks but this decreased their service range by 10%. ^ Wheeler 1992, p. 64. ^ Fumio 1958, p. ?. ^ Gallagher, James P (2004). Meatballs and Dead Birds: A Photo Gallery of Destroyed Japanese Aircraft in World War II. USA: Stackpole Books. p. 154. ISBN 9780811731614. ^ Francillon 1969, p. 62. ^ "TAIC-SWPA No Number Mitsubishi G4M2 Betty (Captured USAAF Mitsubishi G4M "Betty")." J-aircraft. Retrieved 17 October 2010. ^ Francillon 1969, p. 63. 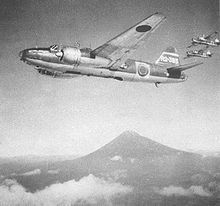 ^ "Mitsubishi Type 1 Attack Bomber / G4M (Betty)". pacificwrecks.com. Retrieved 18 February 2019. ^ "Robert Greinert interview with Pacific Wrecks". pacificwrecks.com. Pacific Wrecks. ^ Taylan, Justin. "G4M1 Model 11 Betty Manufacture Number 1280 Tail 370, −321." Pacific Wrecks, 23 July 2011. Retrieved 1 January 2012. ^ Rocke, Robert. "G4M1 Betty Wreckage at Babo Airfield." Pacific Wrecks, 5 January 2011. Retrieved 1 January 2012. ^ "G4M1 Model 11 Betty Manufacture Number 1800 Tail U2-???". pacificwrecks.com. Pacific Wrecks. ^ "Pacific Wrecks - G4M1 Model 11 Betty Manufacture Number 2806 Tail U-321". pacificwrecks.com. Pacific Wrecks. ^ Aoki 1972, pp. 128–136. Francillon, PhD., René J. Japanese Aircraft of the Pacific War. London: Putnam & Company Ltd., 1979. ISBN 0-370-30251-6. Green, William. Famous Bombers of the Second World War. London: Macdonald and Jane's Publishers Ltd., 1975 (Second edition of 1959 book, reprinted at least twice: 1976 and 1977). ISBN 0-356-08333-0. Morgan, Eric B. "Mitsubishi G4M Betty." Twentyfirst Profile, Vol. 2, No. 17. New Milton, Hantfordshire, UK: 21st Profile Ltd., ISSN 0961-8120. Thorpe, Donald W. Japanese Naval Air Force Camouflage and Markings World War II. Fallbrook, California: Aero Publishers Inc., 1977. ISBN 0-8168-6587-6 (pbk. ), ISBN 0-8168-6583-3 (hc.). This page was last edited on 17 April 2019, at 02:19 (UTC).